The most difficult part of the project proved to be setting up the daily gift delivery. The servomotors were not at all as easy to control as I had hoped. The unforeseen difficulties led to a three-gift limit for each servomotor. The original plan had called for one servomotor to handle six gifts. Reloading the calendar with a second set of 12 gifts after the first set of 12 gifts had been disbursed proved to be a successful workaround. This sets the shaft about mid-position. The values written to the servos used in the project vary between 90 and 190, which in turn correspond to a 120-degree angle. Each servo behaves differently, so it makes sense to play around with the values. to end all servod processes. A stepper motor turns a round disk to the appropriate day for display of the current calendar date. After doing some research, I decided against building a stepper motor driver control and instead chose to use a TB6560 module (Figure 5). 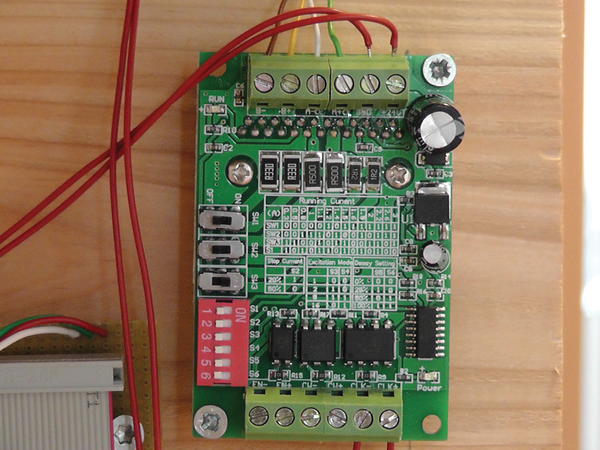 Figure 5: The stepper motor driver control turns the motor just a few degrees each day so the current date will be displayed. When considering the button that will be used to release a gift each day (Stepper.sch), bear in mind that the GPIO interface for the Rasp Pi can only tolerate 3.3V. You can test it with the command gpio readall. As is evident from the name, a stepper motor positions its rotor in a step-by-step process. This makes it possible to achieve exact positioning. As a rule, the rotor of a stepper motor is made from a permanent magnet, and the strator consists of numerous coils wound in precise angles. If the rotor generates a magnetic field, then the coils that compose the strator are activated in a cyclic order, and the motor begins to turn. The rotor generates a rotating magnetic field for smooth rotation. Controlling a stepper motor is not necessarily trivial, so special chips have been developed to accomplish this task, such as the TB6560AHQ stepper motor driver IC chosen for this project. This particular chip supports various operating modes, including half and quarter steps, and it also monitors current. These features guarantee that the motor performs as intended.